I was wondering what had happened to David "funny sunny" Archibald. He hasn't been seen for a good while at WUWT. David is one of the wackier deniers who thinks we are heading for an ice age "any day now". At the urging of State Senator Beau McCoy in late 2013, the Nebraska Department of Agriculture was tasked with commissioning a report on cyclical climate change. The budget for the exercise was $44,000. That right, for a mere $44,000 Nebraskans would be told what was going to happen to their climate. If the Sun was going to sleep with the consequence that cold air from the Canadians would come south faster and longer, Nebraskans would be forewarned and fore-armed. Alas, the effort was abandoned when promoters of global warming in the state offered to do it for free. People who keep up with the climate blog wars will recall that the situation wasn't quite like that. What happened was this. A lawmaker in Nebraska who is a climate science denier was happy enough to support a bill for someone to prepare a report on climate in Nebraska. However he didn't want them to take account of any human factors influencing the climate, so he proposed an amendment to the bill. Given that human factors now dominate global warming (ie climate change not day to day weather), that seemed not just pointless but a waste of money. And you'd have to offer a lot more than $44,000 to climate scientists to persuade any of them to forsake their science for money. They might have gotten Marc Morano or Anthony Watts or one of the other denier bloggers to prepare the report. They come cheap I hear. I don't know why they didn't do that. Alternatively they could have approached some of the Not the IPCC Report writers. I wrote about this at the time, because Judith Curry was arguing that politicians should be able to put constraints on climate studies to suit their political agenda. Her stance was reminiscent of the various attempts to prevent high school teachers from teaching students about biology, wanting to bring their weird religious beliefs into the classroom and ban science. The danger to the promoters of global warming was that the stillborn Nebraskan climate report would have been the first government-sanctioned report on the planet to say that carbon dioxide and the burning of coal are nothing to worry about. A report on cyclical climate change would say that there is something far more serious coming that is going to smack our civilisation like a freight train. That serious thing is one of the cycles that the Nebraskans were going to be told about. One day the science of climate cycles might get out to Nebraska but in the meantime they will be wondering why their winters are getting colder and Spring seems to be delayed and how can they begin planting while their fields are still covered in snow. There you see it. Climate science is a hoax and information is being kept from the poor little Nebraskans. What's odd about this is that David is arguing that the government could be trusted. This is despite the fact that in this case the politician who put up the amendment to the bill wanted scientists to exclude some of the main factors that will affect Nebraska's climate in coming years. More moral authority from the imprimatur of government! It is one thing for books to be published which warn of the severe, solar-driven cooling coming (I’m on my third) and for retired academics to voice concerns over the low standards of US Government-funded climate science, but much more moral authority comes from the imprimatur of government. I know you'll be scratching your head wondering how this article of David "funny sunny" Archibald got past the censor-in-chief at WUWT. Anthony Watts spends a lot of time complaining about "political interference". I saw a couple of tweets that he put out only a day ago where, in his conspiracy-addled brain, he is clearly of the view that IPCC reports can't be trusted because the IPCC is a "political body". I guess he's never read an IPCC report or any of the scientific papers underpinning it. As the climate reports come in, the vague, almost-impossible-to-believe notion that the Obama Administration’s war on coal through the EPA is a peculiar form of malicious self-loathing will be seen with crystal clarity. That there is no scientific basis for what the EPA is attempting to do whatsoever. That the degradation and disruption that the EPA is intent upon is a loathing for America as it is, pure and simple. Instead of the loftiest ideals of “thinking of the children” and so on, President Obama and the EPA are driven by the basest of motives – that their fellow Americans be poorer with reduced opportunities. Now why didn't more than half the people in the USA realise that President Obama is driven by the basest of motives, to reduce all his "fellow Americans" to poverty. And he's got a funny way of going about it, too. 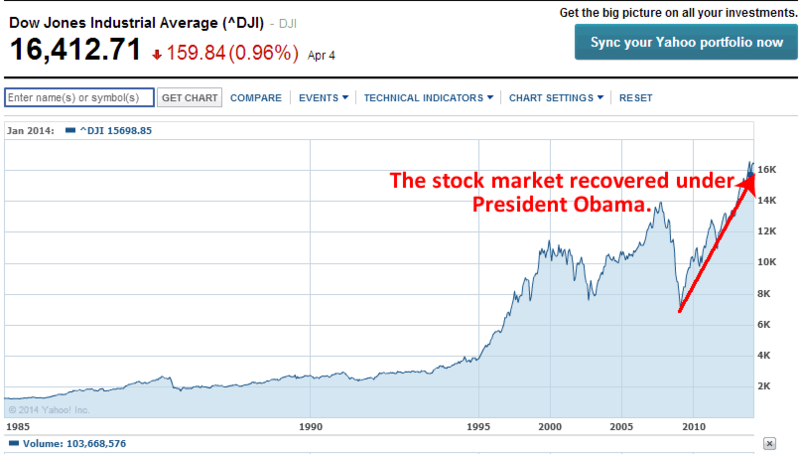 Look at how he impoverished American investors - not! As for people's jobs and other economic measures, well the charts here at CNN show he's not doing a very good job at reducing everyone to a poverty below what George Bush managed. Arguably his biggest coup was helping Americans get health care when they need it. Oh, wait. That can hardly have been prompted by the "basest of motives" can it? One government’s report on something like climate is as good as another’s. Oh, I do wish he'd make up his mind. He's just been telling us that the US government is not to be trusted, now it is. I have a sneaking suspicion that David doesn't really believe what he says. I've yet to see him tout the IPCC report, which is accepted by 193 nation's governments, as being "as good as another's". Incidentally, it looks as if the Nebraskan government has successfully suppressed any information on climate change from its Department of Agriculture. Despite it's claim of "Nebraska Agriculture at Work for You" there is not a peep about climate change. Thankfully here in my home state the government is not so draconian. 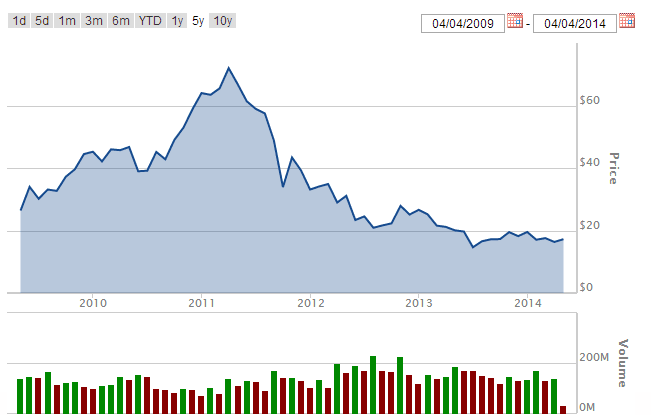 Have David's coal shares plummeted? Here's a short bio of David "funny sunny" Archibald. Interesting concept. Please explain further how the AGW promoters derailed the state effort. The story seems incomplete. We need to know more so that the push back against the hype can be more effective. I think the poster above gives Obama way too much credit. I don’t believe Obama cares one bit for the environment, I think his motives are entirely an effort to support the efforts of an extreme faction of liberals. Not all supporters of AGW science are the same. He gives voice only to those scare mongers whose goal isn’t to clean the environment, but to control every facet of life in America. I just spoke to a friend of mine who called me to talk about cars they want to buy, and then talked about electrically powered cars because the UK had “servos” littered about the country to re-powered electrically powered cars. Apparently it was cheaper than petrol. Well, maybe so in the UK, but CO2 is still emitted. I asked how the electricity that “re-powered” the batteries was generated. We eventually got to gas and coal fired power stations. Which in the bigger picture of the situation, is correct. Then I asked how much CO2 “pollution” was in the air, right now, in their opinion. The answer was 40% (I kid you not – And most people I know “believe” this is the sort of concentration in the air right now). We’d all be dead I said, if that were true. The actual figure, as we know here, is ~3%. In light of your political leanings, which I am sympathetic with, it is amusing that your choice of title, “What is to be done?”, is the same that Lenin used for a pamphlet he published in 1902. The phrase is somewhat famous, at least to someone with an interest in early communist arcana. I suppose it would be noticed in some states, anyway. Coal still makes up 37% of electricity production in the USA. It was 57% in 1985 but only 46% in 1950. I would like to see coal miners and the mine owners perform a pre-emptive strike. A shut down of coal production for thirty days will..."
I too would like to see coal plants shut down for a month: it would be instructive to see the fall in mortality rates over the period. cost of your madness . Yes, just imagine believing what all the worlds academies of science believe! Another overwrought non-comment from an anonytroll. Pointless. "Yes, just imagine believing what all the worlds academies of science believe!" will not look and if you did probably could not understand them . List these "thousands of research papers" please. If you don't, I might think you have just made that up. "It is more a matter of what you imagine they believe ." Or is it a case of believing what I imagine they believe? Oh, come on, that could go on forever and get nowhere. At some point you have to make some judgement of what you think is solid and real. Of course this is where real scepticism counts - remembering to have a reality check every so often to see what has changed. You slightly contradict yourself. Alleging "we" would not look at your "thousands" of denialist papers and then say you cannot be bothered to engage with "us". Is this not a tad hypocritical? Actually I have looked at quite a number of denialist materials while trying to understand if there was anything there. Perhaps towards the more sensible fringes there are some sensible questions and doubts. But on the whole it is a pile of self-reinforcing nonsense with a rather limited scope. Perhaps you should engage and try to learn how to be properly sceptical. "Sadly people like you are will not look"
People like us? Sadly, people like us have been given this line time after time. And every time we look we find one - or more - of the following. 1. The paper doesn't say what the denier thinks it does. So we have wasted our time because a denier does not possess basic reading comprehension. 2. The paper has been thoroughly debunked. So we wasted our time because the denier apparently lives in the land that time forgot. 3. The paper isn't a paper at all. Its a load of twaddle that dodged peer review because the author didn't care that his screed contained numerous 'errors'. So we wasted our time because the denier didn't even know what a research paper was. I am sure there are more cases if I could be bothered to dredge up more memories. But thats enough to show the problem isn't "people like us": the problem is a huge campaign of misinformation funded by fossil fuel companies assisted by a horde of credulous numpties. Well I'm sure you think there are thousands of research papers "telling a different story" but I wonder, Anonymous, whether that isn't something someone told you or that you read somewhere. Have you actually seen and read thousands of such papers? Have you even read a few? If so perhaps you could share just one or two of these research papers and tell me what it is that you find so convincing about them. At least then we'd have a place to start a conversation. Just a few would do as a start!! But to get to "thosandS", you need to find about another 1,975 research papers. Can you please provide some indication of where they have been hidden? Funny, isn't it, how the people with their heads buried in the sand are the first to complain that everyone else has their head buried in the sand? So really, anonymous posters who deny the facts are just writing—in the language of Australia's current leader—unadulterated crap. "Back in 2006, the Russian Academy of Science predicted imminent severe global cooling, beginning in 2012-2015, peaking at around 2055...."
It seems that a paper by an astrophysicist who is a member of the RAS somehow gets promoted in Worralls mind into the RAS's own position. He's not alone. I pointed this out to U.S. Representative Dana Rohrabacher after he made the same bizarre comment as Worrall did in this WUWT guest essay. Just to be clear, Watts promoted Worrall's comment into a guest essay which suggests to me that "very speculative theory" is a euphemism for "conspiracy theory" which supposedly never appears at WUWT or CA or any other contrarian site. What else could one call the "theory" that Chinese and American companies are plotting to take advantage of the impending global cooling Eric Worrall stakes his reputation on by buying land in Australia? Ok done telling me what an ignorant denier I am ? Nup you are just warming up right ? ha ha ha ha ha. Anonymous is backtracking now - I thought there were meant to be "thousands* of papers disputing the greenhouse effect or human influence on the current warming or whatever it is he's disputing. Not a measly few hundred (most of which *don't* dispute AGW in any case). Anonymous, we all probably guessed that you'd go to poptech! My guess is that you cannot find any consistent explanation in his collection for the cause of the current warming, except for greenhouse gases and other human influences. Prove me wrong Anonymous. List five of those papers that show that the greenhouse effect isn't real. Or list five of those papers that "prove" that CO2 hasn't risen. Or list five of those papers that "prove" that average global surface temperatures haven't risen. In fact, if you can list even five papers from poptech's motley collection, written by five different teams (ie not written by the same people) that give the *same* explanation for the current global warming *without* it involving human activity, list them and give a brief summary of the science, I'll honour you with an article on HotWhopper. You'll also need to explain why, if you've managed to find five papers in any of the above categories, you find them credible. Since we are such dills, we need to have it explained to us and, given you are so knowledgeable about science, you are just the man for the job! "Ok done telling me what an ignorant denier I am "
So, on my list of time wasters above, this list would make you a proponent of (1) and (2) and (3). So you proved my point. What, are you trying to be a comedian? So that's it is it? A link to a notorious denier site. Surely with the thousands of research papers you say tell a different story you could have come up with at least one from a top journal say 'Science' or 'Nature'. "Ok done telling me what an ignorant denier I am ? And then you go and prove that you are an ignorant denier by linking to the denier list of lists. You are wrong though. Most of us have actually read through that list before as other ignorant denier's have thrown that list around before. You may notice that most of the papers are published in 'Energy and Environment', who published the famous iron sun paper. Anyone who has more than two brain cells knows that 'Energy and Environment' is ideologically based, and will publish any old crap. Many of the other papers have managed to get published in reputable journals have already been refuted, while most of the rest are written by Heartland experts and are pure bunkum. Interestingly, there are a number of papers that are written by highly respectable scientists, who are known to support the current consensus. It shows that the list is worthless, and anyone who links to it has most likely not even read the linked papers. I've read many of the papers, and not one has provided compelling evidence that manages to completely rewrite the laws of physics. Just face it. You are ideologically driven. You still haven't twigged that there are no published papers in reputable journals that you can cite. Look, you are denying over 150 years of careful and repeatable observations and science. Real scepticism is an inherent part of science, which is why we can be certain that AGW is caused by anthropogenic greenhouse gases. For more information have a read of this. While we're waiting for Anonymous to come up with his five papers, here's a bit of a rundown of the list he likes. The first paper on the list is by Sherwood Idso. The paper isn't disputing AGW, it's just postulating the warming won't be as high as mainstream scientists have estimated. His paper was published sixteen years ago. The Idso's have been twisting actual science for years for various interests. One is by Willie Soon, which should be "'nuff said". His wasn't published in a climate journal. In any case, going by the abstract he doesn't dispute the greenhouse effect, he's just asking some questions and postulating that all the science is wrong about the extent of the effect. The next one is by an economist, Ross McKitrick from the Cornwall Alliance, who by that membership has sworn to not accept climate science, saying his god will look after nature (but not economics). His paper was published in a political science journal that looks like it went belly up after only three volumes. If anyone noticed it, it would have been debunked if anyone thought it worth their while. He published another paper on socioeconomic influences on land use changes in the journal Climate Dynamics. I think he's been pushing that barrow for years to no effect. Who could forget the time he mixed up radians and degrees! Then there's Nicola Scafetta, who Anthony Watts disowned recently, with his astronomical theories about Jupiter and Saturn. After that there's a pack of contrarians publishing in a little known journal that bears no relation to climate (Remote Sensing) - John Christy, Roger Pielke Snr, Roy Spencer are among that lot. We know they don't dispute the greenhouse effect. In this particular paper, this lot are trying to find a reason to argue that climate models are wrong. Without labouring the point, the conclusion is that there is no coherent, consistent explanation of global warming by poptech's papers, and most of them don't dispute the greenhouse effect or AGW in any case (except for a couple of utter nutters). Even Nicola Scafetta doesn't dispute AGW as far as I know. He just likes playing with numbers and looking for patterns to try to prove that humans don't have to wear all the blame. Like I say, most of poptech's papers don't dispute AGW. For example, further down you'll see a paper by Ryan O'Donnell et al. It doesn't dispute the greenhouse effect or the fact that human emissions of CO2 are causing global warming. Then Lindzen, who's been trying to argue not that CO2 doesn't affect temperature but that the effect won't be all that great. Poptech's even listed a recent Spencer and Braswell paper, which doesn't dispute the greenhouse effect or that humans are causing global warming. It's just arguing that ENSO can influence multi-decadal temperature trends and the temperature trend since the 1950 is not a "very strong constraint on our estimates of climate sensitivity" - whatever they mean by that. To keep it simple, perhaps Anonymous could tell us which other explanation for warming he favours. Is it Jupiter and Saturn causing global warming? Or perhaps he thinks it's all down to cosmic rays (that haven't changed). Or maybe he likes any wild hypothesis as long as it gets him off the hook. Even when cosmic rays did change, that didn't change the climate. Richard Alley mentioned (at 42:00 in his 2009 AGU talk) that beryllium proxy data reveal a spike in cosmic ray intensity during the “Laschamp anomaly” ~40,000 years ago, but the corresponding oxygen isotope proxy for temperature didn’t change unusually during that time period. Climate change deniers are like Einstein refuters. Each thinks that they have suddenly and magically found the key to opening the door of the Vault of All Prior Science Refutation, that no one's ever before seen their Remarkable Insight, and that they are pioneers in blazing this new trail. None of them are aware that countless fellow useful idiots have preceded them, using the same rebutted nonsense, and that they no more than roadkill on the road to The Realisation of the Laws of Nature. Snort! NOTE: silly, multiply-refuted list does not become less silly or less multiply-refuted upon umpteenth repetition. Sou, you're right to point out that Spencer and Braswell are agreeing with mainstream science when they argue that ENSO can influence multi-decadal temperature trends. It's also not controversial to say that the temperature trend since the 1950 is not a "very strong constraint on our estimates of climate sensitivity". Consider this figure of sensitivity constraints from the recent IPCC AR5. Notice that the instrumental studies (for instance, the temperature trend since 1950) have larger error bars than the paleoclimate studies, so they don't constrain climate sensitivity as strongly. The scientific conclusion here is that climate sensitivity can be estimated in different ways which have different pros and cons. These double-checks actually strengthen the conclusions of mainstream science, which in 2013 used the same lower bound on sensitivity (1.5°C) as in the 1979 Charney report. "Ok done telling me what an ignorant denier I am ?" Really not my intention or probably anyone else here. But if you treat the people you are addressing as ignorant then you are likely to get that sort of response. You have more than once stated that "we" would not bother with your materials. Yet I suggest to you that most people who think about this subject have looked. And yes you are right, they do not bother any more because it is (mostly) fringe crackpot material. Individuals like you keep pointing to the same pile of discredited and obsolete mumbo-jumbo as if it is offering something new. I cannot count the number of deniers that I have seen pointing to that list - all the way back to when it was "600+" papers and presumably before that. The point is you keep referring to the same stuff that just reinforces what you want to hear. There are probably 100000 climate change papers out there. Go and do some real research and sceptical analysis instead of accepting it second hand from crackpots. Then you will not be an "ignorant denier" any more but a fully fledged real sceptic. Bernard, are you summoning John, Paul, George or, heaven help us, Ringo? "Imprimatur of government"? That's a new one. Is Archibald playing loose with the meaning of "imprimatur" i.e. an official licence issued by the Roman Catholic Church to print an ecclesiastical or religious book? If not, which government body or official does he suggest will issue the nihil obstat prior to the imprimatur? Continuing in the Roman Catholic/papal genre, the Archibald article should be referred to an Archibald bull. Just saying. Perhaps Christopher Monckton will set him straight. Does the 3rd Viscount Monckton of Brenchley "Goodness! Is that me?" Christopher M. really exist? Silly me! I thought he was a vaudevillian doing a caricature of an English peer. "...the Obama Administration’s war on coal through the EPA is a peculiar form of malicious self-loathing will be seen with crystal clarity. That there is no scientific basis for what the EPA is attempting to do whatsoever. That the degradation and disruption that the EPA is intent upon is a loathing for America as it is, pure and simple." This crackpot unintended comedy routine is one of David's finest! Truly one of the great interweb funny men. "The danger to the promoters of global warming was that the stillborn Nebraskan climate report would have been the first government-sanctioned report on the planet to say that carbon dioxide and the burning of coal are nothing to worry about." so a report that is explicitly forbidden to mention anthropogenic factors, and therefore doesn't mention anthropogenic factors is meant to be evidence that anthropogenic factors aren't a factor? impeccable logic there. i think he's just pissed off because the scientists twigged that was the message McCoy was shiiting for, and decided they'd rather not give him any ammunition for his idiotic rhetorical games. it will be damaging ( say plus 3 degrees C ) . be plenty of time to act. I do , as I said the issue is how much warming . show that the greenhouse effect isn't real." Hey Sou , like most people I believe CO2 can cause some warming. it is on you to prove it not me . darkness . "everybody on the other side must be evil evil evil"
Spare me the crap Dave . and bake some scones . it in a few minutes and if I appropriate , respond . Let me know when you have read the first 1000 research papers. Sadly Idunno has comes up with the usual sales pitch . to when at a future date when feeling deeply masochistic . "the IPCC which was setup to promote carbon trading and global warming fear mongering"
"the thousands of whistleblower scientists and academics who are calling "fraud" . Yes there are such lists, try this link .. http://en.wikipedia.org/wiki/List_of_scientists_opposing_the_mainstream_scientific_assessment_of_global_warming"
Misrepresenting others? Put a checkmark in front of that, too. Thing is, just like the deniers at WUWT, for Anonymous it all boils down to protecting his hip-pocket from some yet to appear ransacking. He rejects science because he's scared he'll be asked to pay to mitigate. Yet if he lives in Australia and pays any tax, he's already paying a fair proportion of it for recovery (eg the Queensland flood levy, drought relief, repairing roads, rail and bridges after the amazing Australia-wide floods a couple of years ago, fire recovery). And if he has any household or flood insurance he's already paying extra for climate change, according to the letters I've had from my insurance company. The carbon tax is a pittance compared to what he's going to be paying for recovery and adaptation over the next few years. Though if he's old, as is my guess, he could be on the pension and the rest of us are paying all this on his behalf. As for Anonymous' "wild shot". The science is clear. Cut CO2 or suffer worse consequences. If Anonymous doesn't accept mainstream science then it's he who has to show good cause. The science is already in. "Even assuming evidence unfolds at some point in the future suggesting 3 degrees is possible the fear mongers would need to show there will not be plenty of time to act." You cannot really seriously believe this position? 1. There is already lots of evidence for 3 degrees and you must know this. It may be subject to uncertainty and only a probability but it is evidence. Not to mention that only 2 degrees would be very disruptive in itself. 2. Fear mongers? What is that - some sort of smear against ordinary, everyday scientists and politicians? Not a logical addition to your statement. 3. Is this just setting the bar of proof impossibly high so you can avoid facing the consequences? Everyone everywhere has to make decisions on incomplete information. With imperative decisions it is even more important to act. All that needs to be shown is that there is a good probability and that taking action earlier is precautionary and sensible. 4. Many of the actions we have to take we will have to take at some point when resources run low. And they are on the whole good for us in the longer run anyway. and bake some scones . " You overestimate your capacities. Not only do you not have any real response to anything I have written, you don't have any response to anyone else either. All we can learn from this is that you have a position that is founded on your own needs and not founded on reality. Freud says that people in denial have three excuses: it isn't happening, it isn't me, and it isn't so bad really. You would claim the third kind for yourself (low CO2 sensitivity), although as - apparently - you have discarded all scepticism and 'believe' that silly poptech list, its actually the other two as well. The drowning denier clutches at straws. Nothing we all haven't seen before and very, very boring. There isn't even any mental challenge here for us: its the intellectual equivalent of slapping a naughty six year old who just won't stop screaming. But you will never let yourself see it. So maybe I should go and make a few scones: there would be as much chance of getting sensible conversation out of them. Ha ha Millicent. I think making scones would be more productive for you than trying to talk sense to Anonymous! Interesting that Anonymous is so bereft of rational argument that all he can do is try and belittle you on the basis of your (assumed) gender. Do you think that puts him in a certain generation or is it a general trait of deniers to be so sexist? I (male!) have just made some hot cross buns. Guess that rules me out for manly debate about climate science. I'm ready to start reading when you give me a reference to even one paper in a decent journal that tells another story compared to the current strong scientific consensus. And I don't mean a reference to a thoroughly discredited list on a denier site, I mean a reference to an actual paper in an actual well-respected scientific journal. I watched the video , thank-you . I did not seem much to disagree with . "end is nigh" or even imply it is likely . CO2 as levels increase ." Um, do you even know what that's supposed to mean? Increasing the concentration of atmospheric CO2 does not mean that there is no additional absorbance of infrared radiation by the planetary system. There's a whole swag of not-trival physics involved (nicely summarised in the post and comments here) but the upshot is that for several doublings of CO2 concentration over the pre-Industrial Revolution level the temperature response is effectively logarithmic. Note: that's l-o-g-a-r-i-t-h-m-i-c. Not zero. And at the rate that we are emitting, that logarithmic response is still resulting in a fairly linear temperature response over the next century or two (and quite possible greater than linear) which means that the danger threshold for warming is fast approaching. Like all mainstream scientists since the 1800s, Richard Alley described the warming by CO2 per doubling which automatically tells us its warming is logarithmic. Otherwise the warming would be described in a linear fashion, like per gigaton. Alley's slides on the Great Dying and the spike in insect leaf damage during the PETM show that increasing CO2 warms the planet and that rapid warming causes extinctions and destabilizes ecosystems. That's the mainstream position. Anyone who thinks mainstream science says "the end is nigh" might have been listening to strawman caricatures instead of actually listening to the scientists themselves. Anyone who liked Richard Alley's talk might also like his freely available TV series Earth: The Operators Manual. In it, he reviews why scientists know that most of the warming since 1950 is very likely due to our emissions of greenhouse gases like CO2, and explains that building a clean energy economy will cost about as much as our sewer system. marvelous but there were interesting moments. cosmic radiation had no discernible impact . predict doom , perhaps I missed it . found at this link . in the past and CO2 correspondingly so . one of which is found here . Your recommended "Earth: The Operators Manual"
old for me . Thank-you but I will pass on that . Dunning and Kruger - look here. Well yes I know I am an old skeptical white guy and therefore beyond silly and evil in your mind but to me your absolute confidence in what you believe to be true is exactly why people like me will tend not to bother engaging with you . Live your dream but please spare our families and children from the cost of your madness . It is more a matter of what you imagine they believe . There are literally thousands of research papers telling an entirely different story . Sadly people like you are will not look and if you did probably could not understand them . - tout a Wikipedia list of contrarian scientists, including such luminaries as Fred Singer, Tim Ball, Willie Soon, David Deming and others. Now he's asking about Murry Salby of all people. I expect Cartman will get a suitable response from other people here. Meanwhile, he would do well to use a search engine or even search HotWhopper. Finally we get: Thank-you but I will pass on that . That last sentence pretty well sums up denialism attitudes. Salby's ignorance of decreasing atmospheric O2 and increasing oceanic CO2 was already boring the last time. I'd rather do something more productive and pleasant, like slam my head against a wall. "Um, do you even know what that's supposed to mean?" on the results of several research papers . denier website , how dreadful ! Yes, it is quite dreadful. You ignore mainstream science and choose what you want to believe - mainly Richard Lindzen and his favourite, if antiquated, contrarian sources. Did you check them? You do know that Richard Lindzen's Iris hypothesis does not have any legs, don't you? The IPCC AR5 report states the likely range of climate sensitivity to be 1.5 to 4.5 degrees. It has many references to support that estimate, including paleo studies as well as modeling of current forcings. The fact that you reject mainstream science doesn't have any impact on the science itself. CO2 has increased by 40% with a rise in global surface temperatures of 0.8 degrees, most of which has been attributed to human activity - and it would be higher except for aerosols. Do the sums! A rise of global average surface temperature of only 2 degrees will be bad enough. Given that CO2 is still being emitted more and more each year, it will double in a very short time. It will keep going up as long as we are adding more than can be absorbed. It stays in the air for a long time. That means that CO2 will be well and truly more than double this century if we don't do something about it. Global *average* surface temperatures could end up rising six degrees or more over a very short period of time, which would make life extremely difficult (to put it mildly). If temperatures rose by more than that, many regions will be uninhabitable for periods of the years. If average global surface temperatures rose by 12 degrees (which is not out of the realm of possibility), many areas of land will be uninhabitable all years around - for we highly adaptable human beings. How do you know what I believe? All I have asked for are references to at least some of the thousands of scientific papers you have read that cast doubt on the current consensus on AGW. So far you haven't done so. Don't give up, just give me some references to actual papers. Surely that's not hard? Good grief. Asking a denier to provide at least one research paper published in a reputable journal that provides an alternate model to the observed warming is like trying to get blood from a stone. They come onto this blog with all the bravado and certainty that they are right, yet when asked to provide a single citation, they throw their hands up and give up. Such poor form. the catastrophic global warming scenario"
We KNOW and so do you. Come on Cartman. You can see that people are laughing at you now. You can have the last laugh by giving references to just a very small proportion of those thousands of research papers you have read that dispute the current scientific consensus. while CO2 has continued to increase in leaps and bounds . Which one of us is in denial . the URL quoted below . Wishful thinking isn't enough. We all wish that global warming wasn't happening, but it is. ...just goes to prove what I said before. There has been no significant atmospheric warming for up to 17 years 8 months"
And your point is? The atmosphere is just a small part of the earth. The planet has continued to absorb heat, but its been going into the those big wet things - the oceans. There: I have tried to respond in language suitable for any thicko who still clings to El Nino cherry picks. btw: Use of the El Nino cherry pick isn't too popular among climate change deniers at the moment because there's a threat of a new El Nino which would be at the wrong end of the trend for any idiot stupid enough to use El Nino cherry picks. If there is an El Nino soon, the use of El Nino cherry picks will be resuming for climate change deniers around the year 2020 when - for a few years - you will be telling us the earth is cooling. GISTEMP, HadCRUT4, UAH (TLT) annual means, August 1996 - present; linear fits. Try being sceptical. Check the facts for yourself. Don't listen to climate liars like Monckton. best and most courageous are skeptical , you just refuse to see it through your dung colored glasses. "evil corrupt incompetent turd", "dung coloured glasses"
Signs of frustration? Steve Milloy is not a climate scientist, he's a climate disinformer of long-standing, among other things. Who are these "brightest and best and most courageous"? I think of people like Michael Mann and Phil Jones and Ben Santer who have had to rise above appalling treatment by deniers and disinformers and have continued, with immense courage, to produce top quality research - while people like you complain about being called "science deniers" and try to shoot the messengers. Then when you can't produce the goods, revert to form with your "dung coloured glasses" taunts etc. is an evil corrupt incompetent turd." No coincidence. Denying a clear physical phenomenon of paramount societal importance is evil, corrupt, incompetent and it certainly stinks. Did I ever say Steve Milloy is a climate scientist , of course not . at the chart ( which Steve Milloy did not create , merely post ) . Surely the fact that, as I said, I traced some of Steve's references (incomplete and as antiquated as they were) back to Richard Lindzen's collection would have told you that I "looked at the chart". For someone who blithely accuses mainstream scientists of "knowing nothing", while claiming that you regard perusing links to science as "masochistic" and that "you'll pass on that" when it comes to actual science. Who thinks nothing of calling mainstream science "alarmism" and referring to people who accept and understand much of it as wearing "dung coloured glasses". ...you are remarkably sensitive to us pointing out the obvious and claim that you are being "bullied". Yet it was you who barged into my blog waving your arms about throwing metaphorical if aimless punches, and rejecting everything that HotWhopper stands for - which is demolishing disinformation of the type you are peddling. I posted is correct or not . It is isn't it , you just cannot handle it . Cartman, time you took a deep breath. Point to something that Barry Bickmore wrote about Christopher that is wrong instead of trying to belittle Barry Bickmore. Then think about what is happening in the world. RSS is just one chart of tropospheric temperatures. It's not surface temperature for starters. And Christopher cuts out all that has gone before. Not only that, but Christopher likes to hide the signal by showing noisy monthly data, not annual let alone decadal. I'm not disputing the chart. What I dispute is what you appear to be concluding after seeing his chart. Here is some of what I've written about this in the past. Even so, the earth system is more than just the troposphere. Sometimes more heat goes into the oceans and sometimes more into the air. The land surface heats faster than the seas for obvious reasons. Ice melts as it gets hotter - and continues to do so. The oceans expand from being warmer as well as from melting ice. Bickmore's religious beliefs are irrelevant as were Galileo's, Newton's, Darwin's, Einstein's, etc. But if you want to go down that path. It's obvious that you've never read Bickmore's published works on religion as you've not quoted what it is that is "hilarious" in his publications. Furthermore, you've misspelled "devout" as "zealout" (sic) as Barry Bickmore is not a zealot i.e. he is a devout "Mormon". Got it? But, with Sou's indulgence, if you like to post what is hilarious about Bickmore's works on the LDS religion (they actually don't call themselves Mormons, non-Mormons do that), I'd just love to reply to that. What is more relevant is that Barry Bickmore is eminently qualified to comment on AGW et al unlike Chris Monckton. Now, Bickmore has an extensive Monckton Rap Sheet (Sou posted above), a post on The Church of Monckton and a YouTube video How to Avoid the Truth about Climate Change which explains why he is no longer a skeptic. I guess that you can see where this heading. You're resorting to an ad hominem because … (you should be able to fill in the rest yourself). I've looked at your "chart" and I'll raise you this graph, technically that's what you've posted i.e. a subset of "chart" (A chart (n.) = a diagram, a graph or a table. To chart (v.) = to make a map. Got it?). The graph I've linked is from David Appell's blog post "UAH but not RSS Again at Record 5yr High". "Kinda laughable given that Barry Bickmore is a Mormon religious zealout"
Red herring --> logical fallacy --> fail.
" The IPCC AR5 report states the likely range of climate sensitivity to be 1.5 to 4.5 degrees "
Clearly a misrepresentation of fact . Those are the extremes of model projections. global alarmism of course .
. It has many references to support that estimate, including paleo studies as well as modeling of current forcings. The fact that you reject mainstream science doesn't have any impact on the science itself. CO2 has increased by 40% with a rise in global surface temperatures of 0.8 degrees, most of which has been attributed to human activity - and it would be higher except for aerosols. Do the sums! If you're alleging that all the scientists who prepared that section of the report misrepresented something, then you'll need to be more specific and point out which references they misrepresented. Um? What? Are you being serious? As Sou points out the range of sensitivities quite clearly stated in the report. And what else are the extremes of the model projections other than the range of projections? And why would anybody misrepresent such an ordinary, straightforward detail? Perhaps you do not understand the meaning of the word "range"? (Not median, range). You have really gone to town since I last looked in and are now resplendent in your full denier plumage. I see you have adopted the usual denier methods of never actually engaging with any issue or question but each time just raising another hare for everybody to chase after. After all if you had to actually engage meaningfully it might challenge your prejudices. at the link below . "Quick, shift he goalposts! I made a false claim about Sou making a false claim, so better not apologize and open up a new line of discussion!" Seriously, it's not even true that the range of models is 1.5 to 4.5 degrees. Someone (read: Cartman) who just assumes nefarious motives to the IPCC will never be able to be a constructive discussion partner, so Sou would do well to move Cartman to the Hotwhoppery. It reduces the noise and allows discussions with those who genuinely have a point or honest question. There's a problem with relying on memory, it's fallible. ECS, which is the medium term estimate from doubling CO2 (after things have settled down but before the slow feedbacks take full effect (ie very long term factors) is what I quoted in my previous comment. Again, it's not at all likely it can be pinned down precisely because it's not at all likely that we'll stop adding CO2 right at the very time it doubles. I don't need to ask myself anything but I can understand that you want a particular single number. Thing is, the CMIP median (or mode or mean) won't necessarily be the actual number you want. That's probably why the scientists prefer to provide a likely range. I also think it's odd how deniers want a median of models to be identified rather than also taking account of what observation suggest has happened in the past (ie paleo data), when usually they really, really dislike models and call for observations. "Indeed you should ask yourself why the IPCC is so reluctant to publish a median values ." Why should I ask myself this question? It is not good enough to just make some floating assertion with no context or explanation. Is the IPCC reluctant to publish the median? A citation would be helpful or some confirming details. Is it important they do not publish a median? Please explain why. Just a groundless attempt to ascribe some nefarious motive where there is none. This is just another hare you have set running. Anything rather than admit you are not actually able to properly discuss anything. Getting back to your original squirrel, hare, tortoise comment i.e. the 3 million, 200 hundred and 21 AGW-skeptical, peer-reviewed papers... (Just kidding). Your Pop Tech's plethora of papers, from one of your comments above, supporting the skeptics view of AGW, well … I think that it's best summed up by the following November 2009 comment on the blog post Better Recheck that List by one of the Pop-Tech-referenced authors speaking on behalf of himself and his dear old dad: "… If the peer-reviewed papers support 'Pop Tech's' skepticism then I suggest retitling the post to be: " 450 Peer-Reviewed Papers Supporting 'Pop Tech's' Skepticism of Man-Made Global Warming". I hope that you can appreciate the nuance within the suggested, more appropriate title. And now, in 2014, Pop Tech sails on into another Ice Age, adding more self-classified, peer-reviewed papers, while shouting, " I'm the king of the world!". Interestingly, the "Better Recheck that List" blog post included an 11/11/11 update: "By email, Professor Russell Dickerson, University of Maryland has asked that I add his comment to this post: After repeated communication with the authors of http://www.populartechnology.net I have concluded that the content of the site is intentionally inaccurate and misleading. That site lists a paper on which I am a co-author as "skeptical." Our paper supports the view that man-made climate change is a substantial danger to human health and the environment. The site refused to remove our paper(s) from their list after repeated written requests to do so." In that 11/11/11 email, you should be able to pick out the following: "intentionally inaccurate and misleading", "refused to remove … after repeated written request". And of course, this reinforces that 'the list' you've linked in a comment merely reflects the Pop-Techian view which seriously reduces its reliability and moncktonises it. "I quoted a median value from memory . A full discussion can be found at the link below ." Trying to vindicate his claim that the ECS median value is 1.8°C, Cartman cites a blog post on McI by Nic Lewis arguing that the TCR likely mean value of 1.8°C posited by the IPCC is too large. - considers McI and Nic Lewis are reliable sources of information regarding climate science. Yeah, I saw that article Cartman. Incidentally, you've told us some of your wacky ideas already but I hadn't pegged you for a full-blown conspiracy nutter of the type of Tim Ball (till now). Really and truly! Do you take as gospel every wacky thing that deniers from disinformation organisations (like EIKE or the Heartland Institute) puts out? Are you saying you agree with the statement or are you merely providing data in the hope you'll get named in another HotWhopper article about conspiracy theorist Tim Ball? (Use the search bar above to find out more about Tim Ball. As for Klaus-Eckart Puls, about the only thing I can find out about him is that he's a spokesperson for the European disinformation lobby group EIKE. (And that Tim Ball can't spell his name.) I've no idea whether he said that or not. Whether he did or not it's a worthless statement - having about as much scientific value as Anthony Watts saying what bothers him the most about arguments that there is serious global warming is that "they want to apply taxes"
Tim Ball? You must be having a laugh. Who is Klaus Eckert Puls? Someone who conflates the IPCC and the media and thinks he has made a meaningful statement. Come on Cartman, surely you can do better than this? This is just random noise. Have you got anything significant to say? Tim Ball - really? He has as much credibility as someone who turns up on this blog claiming there are thousands of research papers that show a different story to the scientific consensus on AGW and then refuses to list even one of them. for a full-blown conspiracy nutter of the type of Tim Ball (till now). Is there a global conspiracy ? Not unless you also consider the Christian Church a conspiracy . based on false beliefs with zilch real evidence . Let me ask you these questions ..
- "do you see the majority of religious people as evil " ? the Catholic church operating at all levels " ? they think they are saving the world ( just like you do ) . "This is about science not religion "
control by people who believed they were saving the world ? other times completely independently . operating behind the scenes ? or a consipracist engaged in world manipulation? saving the world or perpetrating global deception ? Um, hate to break it to you, Pet, but Climategate is over, and you lost. And all the rest is just so much mush. And projection. No wonder you're susceptible to the likes of Tim Ball! "To me part of the the answer lies in the fact that humans are predisposed to be religious just as they are predisposed to worry about the weather"
Oh dear. What deep insight. LOL. To me the whole answer is that you are a nutter. Life is too short to be bothered with a conspiracy theorist who has a few sheep loose in top paddock. Tim Ball is big on using the term "alarmism". He's actually following the path of 'false accusation of alarmism' that is used to discredit legitimate warnings. Winston Churchill was labelled as an alarmist for his warnings on the threat posed by Hitler's Germany (M. Makovsky, Churchill's Promised Land (2007) p. 140-1). Labelling Churchill as an alarmist turned out to be particularly infantile given what eventuated. If 'skeptics' of Tim Ball's calibre had been around in 1775 would they've declared Paul Revere is an Alarmist? Skeptics like Tim Ball (and others) use the term 'alarmism' because of its negative connotations through an implied 'panic' and in order to score cheap points by downplaying the danger posed by human-induced climate disruption. Tim Ball (and others) need to learn the difference between the terms, "alarmism" and "alarming". There is a Category 5 cyclone bearing down on the far North Queensland coastline in Australia as shown in this gif animation here and in this predicted path graphic here. I'd be willing to bet that there are extremely few individuals commenting on blogs or social media in North Queensland along the lines of accusing the Bureau of Meteorology or the government authorities of being "alarmist" or ignoring the warnings for the regions in the cyclone's predicted path because it was generated by a "model". (A "model" which amongst other things has correctly predicted the change from a Category 3 to a Category 5 cyclone before landfall.) And I'd be willing to bet that there are very few individuals in the predicted path of the cyclone who, because of their scepticism of "models", are questioning the accuracy of the Bureau of Meteorology's warnings and aren't battening down in anticipation of the cyclone's arrival. "Alarming" and "alarmism" aren't the same thing and Tim Ball just doesn't get it. Cartman started with a lofty "thousands of scientific papers" deny global warming and the insinuation that climate scientists "don't know nuffin'" - except for his mythical authors of the thousands of mythical papers. Now he's sunk as low as quote-mining stolen emails. (+1 what Bill said, BTW) and conspiracy theorists of the One World Government/Agenda21 type. As for Cartman equating religious belief with scientific evidence, I was hanging out for him to tell us how he had a mate who took a photo of a chap with a white beard sitting on a cloud. Or for more robust evidence, maybe his mate climbed a very long ladder stretching up into the same cloud, and cut a lock of god's hair, which was verified as real god hair by his other mate, who's an analytical chemist. His analogy failed before he got to that point. P'rhaps he realised that one person reporting a UFO or god in heaven sighting isn't quite the same thing as thousands of independent teams of scientists collecting and analysing evidence over decades, with all these streams of evidence from multiple scientific disciplines all pointing to the same inescapable conclusions explained by well-established theories. PS To my question to Cartman about whether he's as nutty as Tim Ball (paraphrased), I think it's fair to interpret Cartman's answer as being in the affirmative. Sigh. Setting another couple of hares running Cartman? Just more random noise. Give us something real! How about giving Sou her 5 papers? Surely you can rise to that challenge? Or even one paper you would be willing to defend? the life of the IPCC . To me he is a decent , very intelligent , brave and likeable man . Oh, for God's sake: even you must find yourself ridiculous! Is this your life? You really can't find anything useful to do? But let's get back to the papers you rely on for your assessment of AGW. Tim Ball appears nutty as a fruit cake if you read what he writes. There is no smearing (or swearing) going on here. Tim is an advocate of the One World Government conspiracy theory that he's morphed to incorporate the IPCC, which he believes (or pretends to believe) that the IPCC is a "political" body (it's not) that was set up to help Maurice Strong or Tom Wigley (depends on which day it is) take over the world. When it's not one of them who's going to take over the world he leaves it to your imagination to decide just who or what is going to "take over the world". Tim doesn't accept that more greenhouse gases cause global warming, writing a chapter of the Sky Dragon book that argues that physics precludes the greenhouse effect. And talking of smearing, he's being sued for defamation by at least two climate scientists. It's hard to think anyone could be talking about the same person when they describe him as "decent" or "brave" or "very intelligent". As for likeable - if you class grubby little mud-throwing conspiracy theorists as "likeable" then you have a strange taste in men that would not be shared by most people in the world. "Tim Ball may appear to be nutty if you do not understand..."
And climate scientists may appear to be normal, straightforward and uncomplicated individuals. Though of course we do not understand, do we? Naturally you believe the person who only appears to be nutty and reject the hundreds of people pretending to be rational. That makes sense in your bubble I suppose. I said smearing not swearing ya goof . "The fact that he thinks CO2 has limited effect is based on scientific argument which he explains. He hardly stands alone in the scientific world in the view global warming via back radiation from a trace gas ( CO2 ) is unconvincing." Sorry, that just means he's either ignorant, stupid, or deliberately wrong. global warming via back radiation from a trace gas ( CO2 ) is unconvincing ." Yes, we all know that some people think that back radiation doesn't exist, but really, it's based on ignorance and ideology. Back Radiation by greenhouse gases is not just a theory, or an opinion, it is measurable!!! It was first measured in the 1890's. That you find it unconvincing, well, it's because your ideology and total ignorance prevents you from understanding it. Without back radiation, the earth would have a night time temperature close to the moon's night time temperature. You have still failed to provide a single published paper, so it is only YOU who is unconvincing!! that is supposed to going through meltdown . Oh dear, what have we here? Another anonymous commenter with a punctuation problem shouting "Squirrel!". Looks like a pattern is emerging. Quick, call Nicola Scafetta. And we have another who cries "Look! Squirrels!" Why do these hit and run commentators do this? Do they think they are making a sharp point? The question you should be asking yourself, Anonymous, is "Yes, it is kind of strange sea ice is increasing if the world is warming. Is there a possible explanation?". But that would involve real scepticism and some scientific ability which you do not possess. You will not find real science at a denier website Anonymous. That is just self-delusion. "For those very few of you who are interested in real science there is an explanation here"
You have got to be a poe because anyone with a rudimentary knowledge of the adiabatic lapse rate can see the mile wide holes in the 'presentation' in the ideological blog you linked to. All you are showing is how completely enthralled and smitten you are with ideology. "The explanation is further supported by new research found here"
"Based on the GEOS-Chem/APM simulations, a decrease in ionization rate associated with GCR flux change from solar minimum to solar maximum reduces global mean nucleation rates CN3, CN10, CCN0.8, CCN0.4, and CCN0.2 in the lower troposphere (0–3 km) by 6.8%, 1.91%, 1.36%, 0.74%, 0.54%, and 0.43%, respectively." So using a model, they managed to get at most a 6.8% influence. That's right, a less than 10% influence on "global mean nucleation rates". Nothing about this effect on temperature, or in a real world situation. What you have illustrated is how ideological blogs will distort and lie to suit their own agenda. When is the penny going to drop that those sort of blogs are just ignorant, illogical and just plain wrong, and anyone who thinks that they present real science is totally freaking deluded. Cartman gone back to being Anonymous? Too many questions to answer? If you were interested in really understanding anything, you'd stay on one topic until we agree. The easiest question above for Cartman is to list Tim Ball's peer-reviewed climate-science articles. Abstract of new paper avoids the inconvenient truth that measured GCR flux does not have a trend that explains a trend in temperature. There may be a relationship on the 11-year solar cycle, but that's it. I notice that the denier sites have simplified the flow chart from the solar output hypothesis paper. I guess they don't think the slightly more complex version from the paper is dumbed down enough. "Do you really not understand the cumulative effect of that over years . Like all the accumulated CO2 - sorry, you don't think that has any effect. Silly me. Changes in GCR flux only work one way, like a diode? Amazing: "it's all cycles", until it's convenient that it isn't. Don't you know that conservation of energy works differently in libertarian physics? It is highly selective. Some kinds of energy can just disappear. Others can get bigger until they are efficacious climate forcings. It's wonderful stuff. I dare say one of these days it'll get written up in a decent journal and we can all stop worrying. I had noticed that the laws of libertarian physics don't obey Scottie's description - they can be changed. The simplest way is just to make stuff up. fairly quickly based on what has happened to my last few posts. Good luck with your lives . Your comments haven't disappeared, Cartman. They've been delicately moved but carefully preserved in their proper place. I wonder - is Cartman KarenMackSunspot? Different style, don't you think Bernard?